A study about Bombinin was released from EurekAlert! TOKYO INSTITUTE OF TEC HNOLOGY. A study about Bombinin was press released form TUAT and Yokohama National University. We held cherry blossom viewing and tea party! Dr. Kawano gave a lecture on SPIRITS Int. Symp.@Kyoto. The title was "Artificial Cell Membrane System Integrated by Microfluidic Technologies". A graduation ceremony and degree ceremony was held and master's degree (engineering) was awarded to Saigo-kun, Tamoysu-kun and Matsushita-kun, and bachelor's degree (engineering) was awarded to Izumi-san, Takeuchi-san, Numaguchi-san and Yamaji-san. Dr. Kawano gave a lecture on The 139th Annual Meeting of the Pharmaceutical Society of Japan@Chiba. The title was "Construction of membrane molecule evaluation system using　Artificial Cell Membrane System". Izumi-san, Takeuchi-san, Numaguchi-san and Yamaji-san gave a poster presentation on Molecular Robotics @ Tokyo Tech. Dr. Shoji, Takeuchi-san, Numaguchi-san won the Young Scientist Award. A study about Nanoneedle-Probe conducted by Dr. Shoji was published in Nikkei Sangyo Shinbun. Dr. Iiro (University of Helsinki) were assigned as a visiting scholar. Izumi-san, Takeuti-san, Numaguchi-san, Yamaji-san gave a presentation of Graduation thesis@TUAT. Please join Kawano lab.! More detail. under a low energy (low temperature, ordinary pressure). > Microfabrication can create controlled microstructures. > It is difficult to create natural structures under a nanoscale (missing area). the nano scale structure produced by living things in artifacts. Hydrophobic and Hydrophilic Interaction in the water. > Membrane proteins perform various functions in the cell membranes. outside and inside the cells. > Application for biosensor, drug development and physicochemical study in controlled nano-space. > Utilizing molecules, proteins, DNA/RNA, lipid, cell, MEMS, microfluidics techniques in our study. > Microfabrication by photolithography with plasma-etching and exposure‑masking. > CAD/CAM micromilling for plastic fabrication. are formed at the surface of aqueous droplets. > Two droplet contact together and bilayer lipid membrane can be formed. various types of lipid molecules. > A translocating molecules through the pore show the blocking current. > DNA unzipping make the blocking time longer. > Application: drug testing, food inspection, and diagnostic pathology. parallel computation which is difficult for existing computers. time by electrical detection using nanopore sensing. > Nanopores enable the detection and translocation to next droplet at the single molecule level. > Micro RNA(miRNA) is non-coding RNA, and it shows overexpress in cancer. > The pattern recognition is necessary because expression pattern of miRNAs differ with cancer types. > Application to simple diagnosis is expected. > Nanopores used for sensing include various types of biological and solid nanopores. > Characterization of these nanopores can find out optimal nanopore for sensing. diagnostic marker protein with high sensitivity. a synthetic metal-organic porous (MOP) into lipid bilayers. the resting membrane potential by using dual channels. molecule with the geometry of an Archimedean cuboctahedron. > Antimicrobial peptides kill cell bacteria by forming nanopore into lipid bilayer. > Pore-forming activity of the antimicrobial peptide is measured by electrical measurement. movement of peptides on membrane. all implemented in liposomes or hydrogels. and attempted to form double-stacked pBLMs in micro-meter scale. form a five-layered flow with aqueous and lipid/oil solutions. solutions and allowing contact between the two lipid monolayers. Proceedings of MicroTAS, 2018, 202-203. Proceedings of MicroTAS, 2018, 570-571. Proceedings of MicroTAS, 2018, 1406-1408. Proceedings of MicroTAS, 2017, 963-964. Proceedings of MicroTAS, 2017, 219-220. Proceedings of MicroTAS, 2017, 1250-1251. Proceedings of MicroTAS, 2017, 281-282. Proceedings of MicroTAS, 2017, 1549-1550. Proceedings of MicroTAS, 2017, 1328-1329. Proceedings of MicroTAS, 2014, 2125-2127. Proceedings of MicroTAS, 2014, 1790-1792. A study about Nananeedle-Probe conducted by Shoji-san was press released from TUAT. A study about diagnostics of small cell lung cancer with DNA computing conducted by Hiratani-san was press released from EurekAlert! A study about diagnostics of small cell lung cancer with DNA computing conducted by Hiratani-san was press released from TUAT. A study about microRNA detection at femtomolar concentration conducted by Hiratani-san and Zhang-san was press released from TUAT. A study about synthetic ion channels conducted by Dr. Kawano was appeared in the Chem-Station. The achievement of the study about nanopore DNA logic operation conducted by Ohara-san was published in Mynavi News. The achievement of the study about nanopore DNA logic operation conducted by Ohara-san was press released from TUAT. The collaborating research with Prof. Furukawa (Kyoto Univ.) was published in Mynavi News. A study about theranostics was published in NIKKEI SANGYO SHIMBUN. A study about theranostics was published in Nikkei Web and Mynavi News. A study about theranostics conducted by Hiratani-san was press released from TUAT! 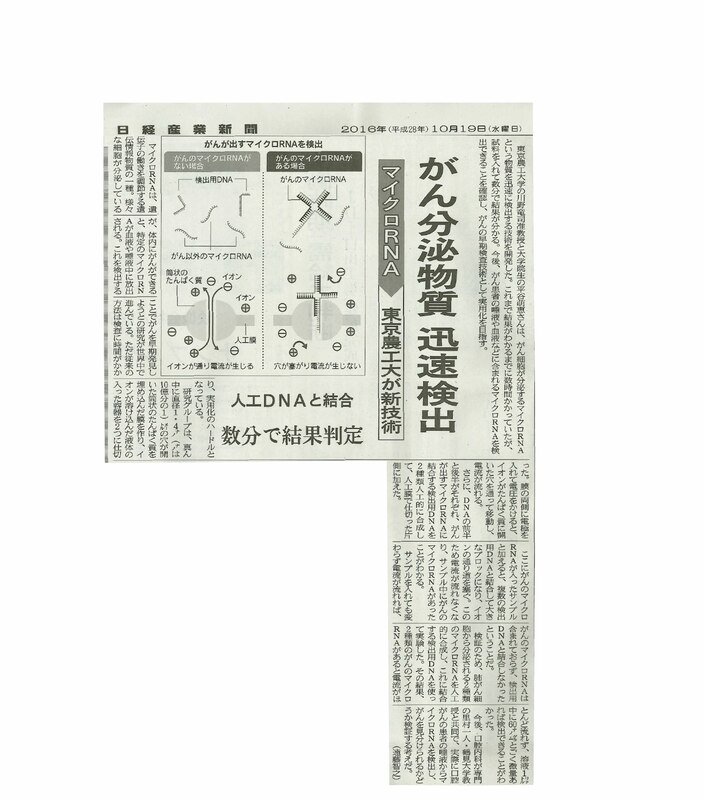 Rapid detection of microRNA was published in NIKKEI SANGYO SHIMBUN. Measurement of membrane protein near the top of Mt. Fuji performed by Dr. Kawano was registered with Guinness World Records as "the highest altitude biological cell experiment took place at 3,623 m."
Measurement of membrane protein near the top of Mt. Fuji was published in NIKKEI SANGYO SHIMBUN. Dr. Shoji, Takeuchi-san, Numaguchi-san won the Young Scientist Award on Molecular Robotics @ Tokyo Tech. 5th Cyborgnics@Keio univ., Numaguchi-san won a special award and Takeuchi-san won an audience award. Dr. Kawano was commended by the Dean of TUAT! Dr. Kawano gave a lecture on The 28th Annual Meeting of The Japanese Society of Oral Medicine & The 31st Annual Meeting of The Japanese Society of Oral Diagnosis / Oral Medicine＠Yokohama and received a commendation. The 2nd science live ticket＠Konan Univ., Shimizu-kun and Izumi-san won encouragement award. Numaguchi-san won excellent presentation award. Molecular Robotics@Sendai, Shimizu-kun got the Young Researcher Poster Award. Oral presentation for Graduation theses, Tada-san got the best presentation award. Oral presentation for Master theses, Hiratani-san got the best presentation award. The 4th Cyborgnics symposium@TUAT, Saigo-kun and Tada-san won excellent dawn research award. Shimizu-kun won excellent presentation research award. The 34th Electrochemical Society of Japan Summer School, Hiratani-san got the best poster award. 2nd Japan-Korea International Symposium on Cyborgnics@Beppu, Hiratani-san got the "BEST POSTER PRESENTATION AWARD." The 3rd Cyborgnics symposium@Suzukake Campus of Tokyo Tech., Matsushita-kun won excellent dawn research award. The 54th Annual Meeting of the Biophysical Society of Japan@Tsukuba International Congress Center, Hiratani-san won Student Presentation Award! Shoji-san won the 2016th research grant from The Okawa Foundation for Information and Telecommunications. microTAS 2016@Dublin, Ireland, Ohara-kun gave oral presentation. Hiratani-san won CHEMINAS Young Researcher Poster Award. The 34th Electrochemical Society of Japan Summer School, Watanabe-kun got the best oral award and Hiratani-san got the best poster award. IEEE ICMA 2016@Harbin, Dr. Shoji got the "Toshio Fukuda Best Paper Award in Mechatronics." Oral presentation for Graduation theses of B4, Hiratani-san got the best presentation award. Ohara-kun, Watanabe-kun, Sekiya-kun, Hiratani-san got the research encouragement award for an alumni association. microTAS 2015@ Gyeongju, Korea Watanabe-kun gave oral presentation. The 5th CSJ chemical festa 2015, Watanabe-kun got the best poster award. The 33th Electrochemical Society of Japan Summer School, Watanabe-kun got the best poster award. The 1st Cyborgnics symposium, Watanabe-kun got the best oral award. Take the JR Chuo Line from Tokyo Station (rapid train) to Higashi-Koganei Station: 40 minutes. Walk about 10 minutes to campus. Take the JR Chuo line tom Musashi-Koganei Station. Walk about 20 minutes to campus. ・Tokyo Institute of Technology / Takinoue Lab. ・Tohoku University / Tanaka Lab. COPYRIGHT(c) 2014-2018 KAWANO Lab. All Rights Reserved.